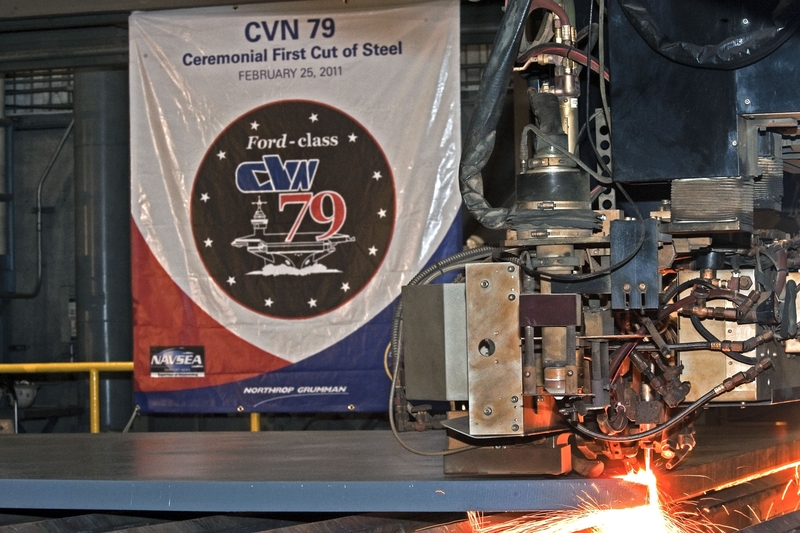 NEWPORT NEWS, Va., Feb. 25, 2011 -- Northrop Grumman Corporation (NYSE:NOC) cut one of the first pieces of steel for the second ship in the Gerald R. Ford class, CVN 79, during a ceremony at the company's Shipbuilding sector in Newport News. Rear Adm. Michael McMahon, program executive office for Aircraft Carriers, said CVN 79 will soon have a name and a crew and will be a great ship. He also recognized the shipbuilders from Newport News and said, "While the carriers are recognized as a national asset so too is this shipyard and the shipbuilders that are in this yard." The Newport News shipyard is performing this work under a construction preparation contract that allows for engineering, planning, long-lead time material procurement and initial manufacturing to begin before the full construction contract is awarded. 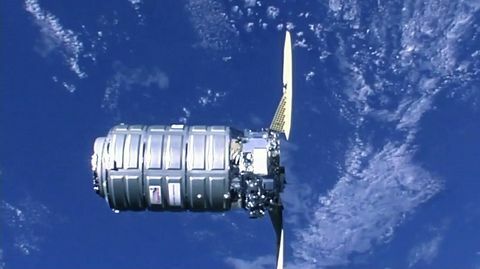 "The U.S. Navy must be ready to respond to the challenges that lay ahead," said Rep. Bobby Scott (Va-3). "To ensure the Navy's future readiness, shipbuilding must remain a top priority of our national defense strategy." 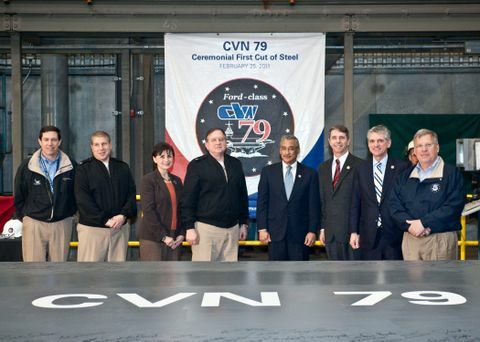 Full construction of the yet unnamed CVN 79 is anticipated to begin in late 2012 with delivery to the U.S. Navy scheduled for 2020. 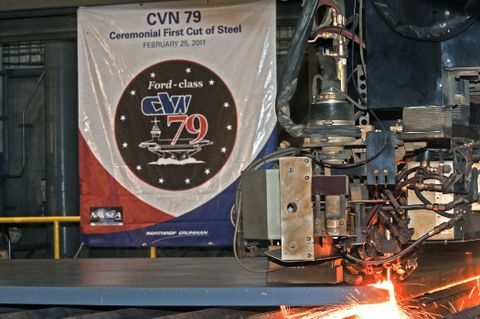 Construction is currently underway on the first ship of the class, Gerald R. Ford (CVN 78), with about 25 percent of the structural units already in dry dock. "Having two carriers under construction within a five-year period is the kind of stability that we all benefit from – the Navy, the shipbuilders, our suppliers and our country," said Matt Mulherin, vice president and general manager for Northrop Grumman Shipbuilding. "It allows for the most efficient flow of the workforce from one ship to the next, and facilitates a learning curve. This stability is key to cost efficiency and to the health of our industrial base." Ceremony attendees included Navy and government officials, and the Newport News employees building the carrier. Rep. Rob Wittman (Va-1) thanked the shipbuilders for the work they were doing on CVN 79. "The men and women that serve can't do their duty without the great ships that you all put underneath them and the great quality of work that goes on here." The Gerald R . Ford class will continue the legacy of highly capable U.S. Navy nuclear-powered aircraft carrier ship platforms. 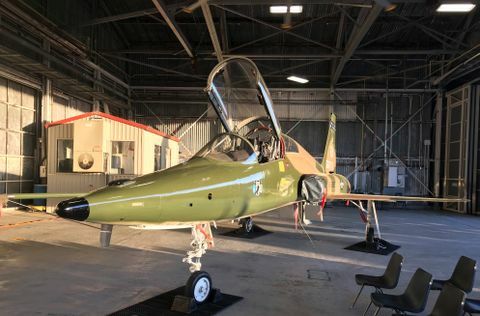 Enhancements incorporated into the design include flight deck changes, improved weapons handling systems and a redesigned island, all resulting in increased aircraft sortie generation rates. It will also include new nuclear power plants, increased electrical power generation capacity, allowance for future technologies and reduced workload for the sailors, translating to a smaller crew size and reduced operating costs for the Navy. "To the shipbuilders that are here today, I hold you in very high regard," said Rep. Scott Rigell (Va-2). "From one American to another, thank you. Thank you for what you're doing. Thank you for producing such fine vessels for our young men and women to serve on that keep us safe around the world."